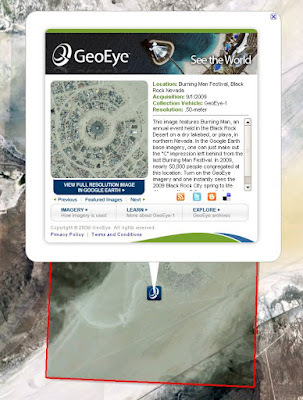 , views of the pyramids in Egypt, and images showing urban expansion in China. 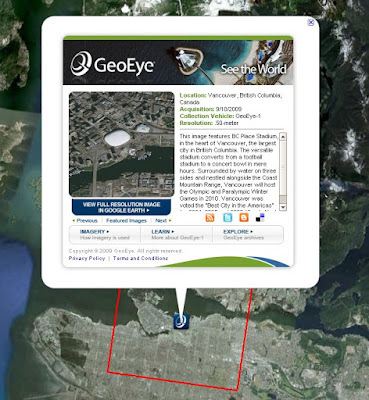 While we're constantly adding such great imagery, what we've published to date represents only a subset of the available imagery from GeoEye-1, which is capable of collecting hundreds of thousands of square kilometers of imagery every day. From this stream of GeoEye-1 imagery, we regularly receive images that we think would be of special interest to Google Earth users; some of these images are of interesting places, like Mt. 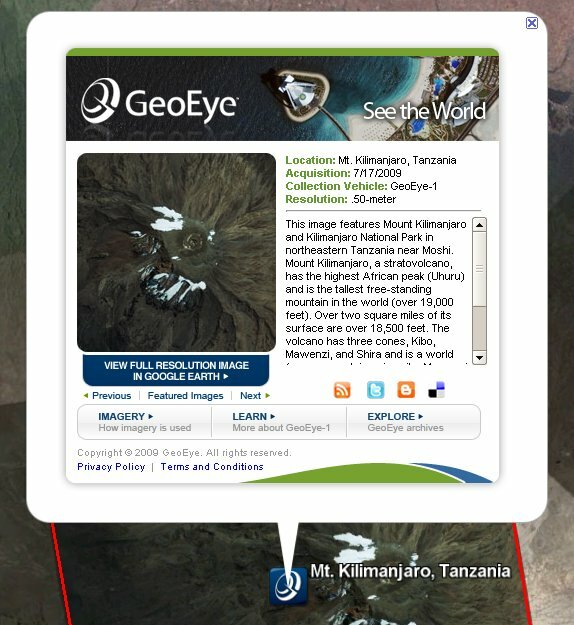 Kilimanjaro or Las Vegas, and others relate to current events, like preparations for the 2010 Winter Olympics in Vancouver. However, it can take a bit of time for these images to be fully integrated into Google Earth and Google Maps given the processing time required, which includes image orthorectification and blending. To highlight some of these broadly-interesting GeoEye-1 images before they can be fully integrated into Maps and Earth, we're excited to announce the new 'GeoEye Featured Imagery' layer in Google Earth. Included within this layer are 20-30 Featured Imagery placemarks, including a thumbnail of the image, a link to view the image in full-resolution, and a wealth of information about the scene, including resolution, collection date, and a narrative about the location. Additionally, you'll find links to other images in the collection, and links to social networking sites, including Twitter, which allow you to share favorite scenes with others. 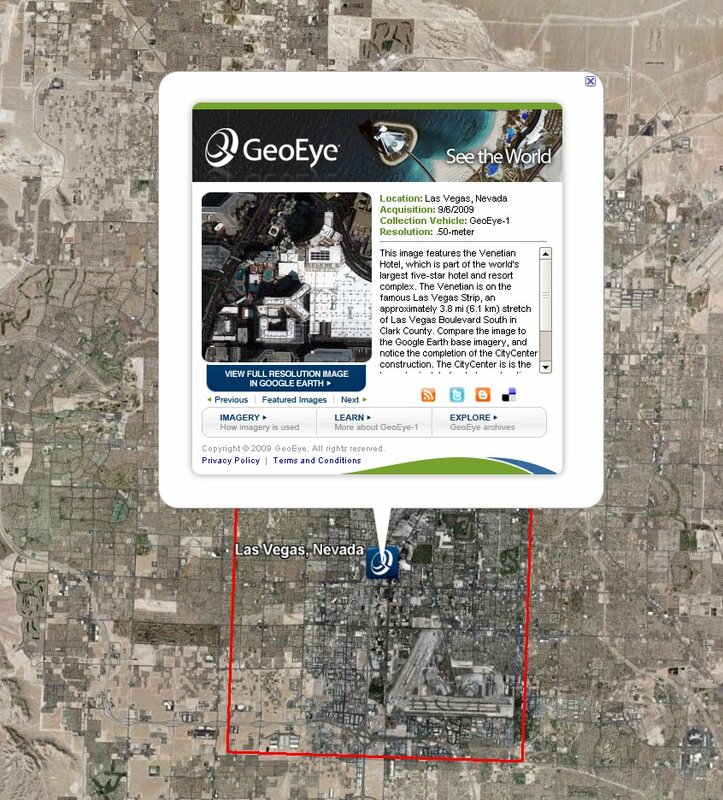 Since the launch of GeoEye's GeoEye-1 satellite, we've added many gigabytes of high-resolution GeoEye-1 imagery to Google Earth and Google Maps, including a scene from the 2009 Presidential Inauguration, views of the pyramids in Egypt, and images showing urban expansion in China. 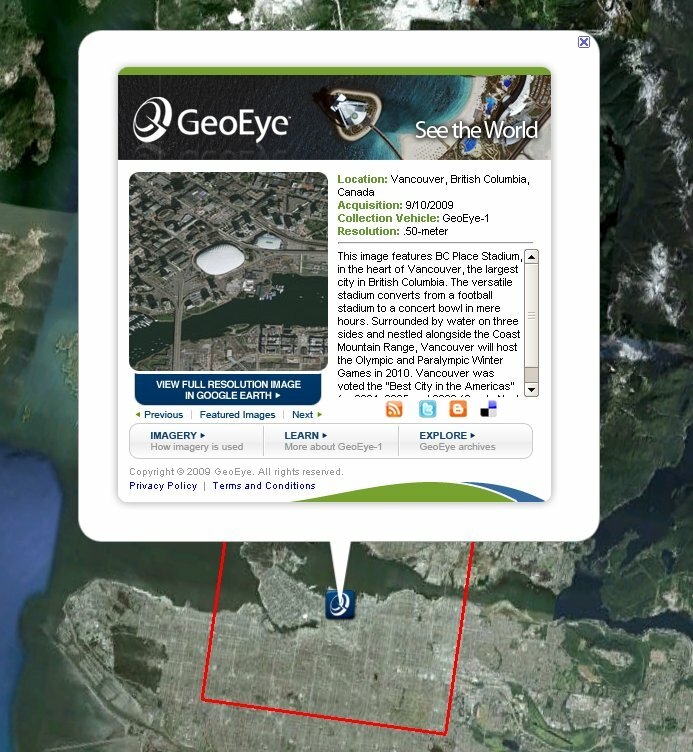 While we're constantly adding such great imagery, what we've published to date represents only a subset of the available imagery from GeoEye-1, which is capable of collecting hundreds of thousands of square kilometers of imagery every day.